Here are some of GreatDad must have Father’s day gifts to give to your dad on Fathers Day. 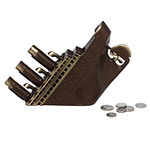 Just the Father’s day gift for him if he’s ready to trade in the big jar full of pennies. 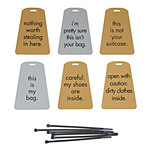 Any traveling dad will appreciate the humor in these luggage tags and he can always pass on the pink one to mom. This photo album as a Father’s day gift gives dad something to do with all those pictures and also gives him a Christmas gift idea six months in advance. Alternately, kids and mom can make up the book with pictures of him and give it fully completed. Surprise your dad with a Father’s day gift of a bouquet of flowers on Father’s Day this year. Who says only dads can give flowers? Let your dad be on the receiving end for once. Say it with wine for the connoisseur dad on Father’s Day. What better Father’s day gift for your dad than to spend Father’s Day with a glass of his favorite wine lounging on his favorite chair with a book to read? Surprise your dad with hours of movie magic with a subscription to Netflix the online movie rental service. Especially a great Father’s day gift for the movie buff dad who like to take in the reel action. If you have a lot of digital pictures and are always frustrated that there never any printouts, make a picture book. 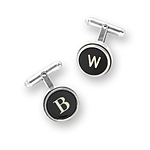 A Father’s day gift for the dad who would like everything to be done for him. Other useful resources to Father’s Day Gifts to please Dads.